Cozy Reader Club is a monthly book subscription box. In each box, they include a recently released hardcover women’s fiction novel, handmade items, coffee or tea (or hot chocolate), and a gourmet treat! 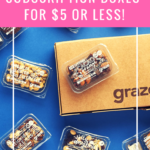 COUPON: Use coupon code READCOZY to save $5 off your subscription! The Products: In each box, you’ll discover 4-6 items including a recently released women’s fiction novel, artisanal coffee, tea or hot chocolate, beautiful handmade items and gourmet handcrafted treats. Check out all of our Cozy Reader Club reviews and our Book Subscription Box reviews! This box comes with an info card detailing the items included. Cozy Reader Club has been doing a great job at picking a newly released and popular book each month, and this book fits that bill and is also getting excellent reviews! I’m only a few chapters in, but I’m already invested in Shelby and want to see her find happiness again. Based on the reviews I’ve read of this book, it’s a long journey for her to get to that place, but the book is totally worth the trip. This wool, hand-knit beanie has a wavy pattern that gives it texture and makes it a little more special. I’m a beanie-wearer 24/7 in the winter, so I think this is a perfect item for a Cozy box! This tea is a blend of cinnamon, ginger, vanilla, clove, nutmeg and black tea. I love all those flavors, and this tea is another hit for me. And it comes with an adorable spoon! This is a hand-stamped vintage silver spoon. So cute! Verdict: This box has a value of about $80 (that’s with the discounted Amazon sale price of the box). I think that’s a good value if you sign up with the $5 off coupon ($60 a month). Cozy Reader Club is still on the high-end in terms of cost for a monthly book box, so it probably isn’t for everyone, but I think they do an excellent job delivering on their promise of what you can expect in a box, and everything always feels special! This box is definitely about the experience! What do you think of the November Cozy Reader Club box?